We are proud to offer a fine line of high-quality, low consumption solutions that can be incorporated in practically every aspect of your landscape lighting plans. This is a technology that has been around for quite some time. However, up until recently it has only been used in the computer and electronics industries, due to previously limited brightness. What we are talking about is called LED lighting. An LED is nothing like a conventional light bulb, as it does not use a filament to produce light. Instead, an LED, which stands for "Light Emitting Diode", produces light electronically. This technology requires much less energy and produces significantly less heat. It offer many advantages in comparison to conventional light sources; less energy demand, much longer lifetime and increased sturdiness. Also, it is more compact and quicker acting. On the flipside, it more costly and needs more stringent current and temperature management than conventional lighting solutions. 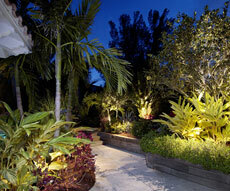 Most landscape lighting projects have and continue to use either incandescent or halogen bulbs. Both of these lighting options have numerous characteristics that are contrary to environmental friendliness; they have a short to medium life, generate significant amounts of heat, are fragile and very energy inefficient. On the other hand, they are inexpensive to moderately priced. If you already have a landscape lighting system utilizing conventional light sources, you can migrate to an LED system at whatever pace you desire. 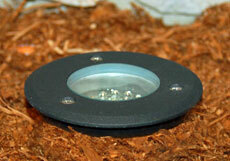 LED's do require much less voltage, however it is in the fixture that the voltage conversion takes place. Therefore, all that will need to be done is to have a current light fixture replaced with an LED light fixture. 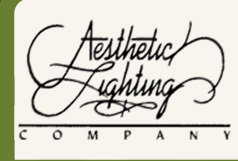 If you are considering a new landscape lighting project, Aesthetic Lighting is your one-stop solution for determining your needs and implementing an outdoor illumination plan that can be altogether stunningly beautiful, energy efficient, and "green." 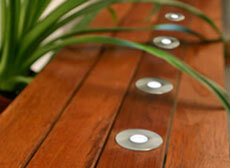 Call Aesthetic Lighting today to find out more about this exciting new environmentally friendly technology!